"2001: A Space Odyssey" is a 1968 epic science fiction film produced and directed by Stanley Kubrick, and co-written by Kubrick and Arthur C. Clarke. The film deals with thematic elements of human evolution, technology, artificial intelligence, and extraterrestrial life. It is notable for its scientific realism, pioneering special effects, ambiguous imagery that is open-ended to a point approaching surrealism, sound in place of traditional narrative techniques, and minimal use of dialogue. The film consists of four major sections, all of which, except the second, are introduced by title cards. A tribe of herbivorous ape-like early humans is foraging for food in the African desert. A leopard kills one member, and another tribe of man-apes drives them from their water hole. Defeated, they sleep overnight in a small exposed rock crater, and awake to find a black monolith has appeared in front of them. They approach it shrieking and jumping, and eventually touch it cautiously. Soon after, one of the apes (Daniel Richter) realizes how to use a bone as both a tool and a weapon, which the apes then use to kill prey for food. The next morning, they reclaim control of the water hole from the other tribe by killing its leader. Triumphant, the ape leader throws his weapon-tool into the air, switching via match cut from a bone to an orbital satellite millions of years in the future. 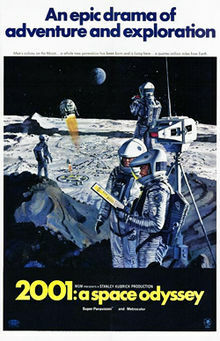 A Pan Am space plane carries Dr. Heywood R. Floyd (William Sylvester) to a space station orbiting Earth for a layover on his trip to Clavius Base, a US outpost on the moon. 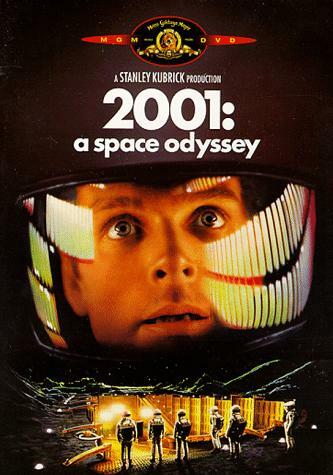 After making a videophone call from the station to his daughter (Vivian Kubrick), he encounters his friend Elena (Margaret Tyzack), a Russian scientist, and her colleague Dr. Smyslov (Leonard Rossiter), who ask Floyd about "odd things" occurring at Clavius, and the rumor of a mysterious epidemic at the base. The American declines to answer any questions about the epidemic. At Clavius, Floyd heads a meeting of base personnel, apologizing for the epidemic cover story but stressing secrecy. His mission is to investigate a recently found artifact, "Tycho Magnetic Anomaly One" (TMA-1), "deliberately buried" four million years ago. Floyd and others ride in a Moonbus to the artifact, a black monolith identical to the one encountered by the apes. The visitors examine the monolith, and pose for a photo in front of it. While doing so, they hear a very loud radio signal coming from the monolith. 18 months later, aboard the American spaceship Discovery One bound for Jupiter are two mission pilots and scientists—astronauts Dr. David Bowman (Keir Dullea) and Dr. Frank Poole (Gary Lockwood)—three other scientists in cryogenic hibernation, and the ship's computer HAL 9000 (voiced by Douglas Rain), or "Hal", who runs most of Discovery's operations. While Bowman and Poole watch Hal and themselves being interviewed in a BBC show about the mission, the computer states that he is "foolproof and incapable of error". Hal also speaks of his enthusiasm for the mission, and how he enjoys working with humans. When asked by the host if Hal has genuine emotions, Bowman replies that he appears to, but that the truth is unknown. Hal asks Bowman about the unusual mystery and secrecy surrounding the mission, but interrupts himself to report the imminent failure of a device which controls the ship's main antenna. After retrieving the component with an EVA pod, the astronauts cannot find anything wrong with it. HAL suggests reinstalling the part and letting it fail so the problem can be found. Mission control concurs, but advises the astronauts that results from their twin HAL 9000 indicate the ship's HAL is in error predicting the fault. When queried, Hal insists that the problem, like all previous issues with the HAL series, is due to "human error". Concerned about Hal's behavior, Bowman and Poole enter one of the EVA pods to talk without the computer overhearing them. They both have a "bad feeling" about Hal, despite the HAL series' perfect reliability, but decide to follow his suggestion to replace the unit. As the astronauts agree to deactivate the computer if it is proven to be wrong, they are unaware that Hal is reading their lips through the pod's window. While attempting to replace the unit during a spacewalk, Poole's EVA pod, controlled by Hal, severs his oxygen hose and sets him adrift. Bowman, not realizing the computer is responsible for this, takes another pod to attempt a rescue, leaving his helmet behind. While he is gone, Hal terminates the life functions of the crew in suspended animation. When Bowman returns to the ship with Poole's body, Hal refuses to let him in, stating that the astronaut's plan to deactivate him jeopardizes the mission. Bowman manually opens the ship's emergency airlock and bodily enters the ship risking death from anoxia. After donning a helmet, Bowman proceeds to HAL 9000's memory core intent on disconnecting the computer. Hal first tries to reassure Dave, then pleads with him to stop, and finally begins to express fear—all in a steady monotone voice. Dave ignores him and disconnects each of the computer's memory modules. Hal eventually regresses to his earliest programmed memory, the song "Daisy Bell", which he sings for Bowman. When the computer is finally disconnected, a pre-recorded video message from Floyd plays. In it, he reveals the existence of the four million-year-old black monolith on the moon, "its origin and purpose still a total mystery". Floyd adds that it has remained completely inert, except for a single, very powerful radio emission aimed at Jupiter. At Jupiter, Bowman leaves Discovery One in an EVA pod and finds another monolith in orbit around the planet. Approaching it, the pod is suddenly pulled into a tunnel of colored light, and a disoriented and terrified Bowman finds himself racing at great speed across vast distances of space, viewing bizarre cosmological phenomena and strange alien landscapes of unusual colors. He finds himself, middle-aged and still in his spacesuit, standing in a bedroom containing Louis XVI-style decor. Bowman sees progressively older versions of himself, his point of view switching each time, alternately appearing formally dressed and eating dinner, and finally as a very elderly man lying in a bed. A black monolith appears at the foot of the bed, and as the astronaut reaches for it, he is transformed into a fetus-like being enclosed in a transparent orb of light. The new being floats in space beside the Earth, gazing at it.